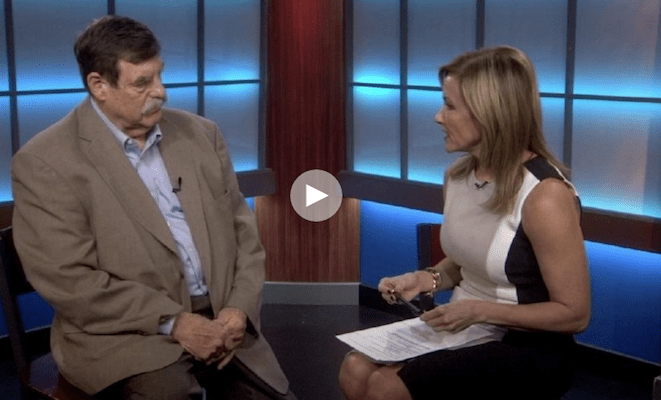 In a TV interview on Friday, Larry Earle, the CEO of shuttered San Antonio-based for-profit Career Point College, gave the game away about what many for-profit colleges are all about. Defending his closed school against findings by the U.S. Department of Education that Career Point had engaged in financial aid fraud and mismanagement, and facing lawsuits filed by a growing number of his former students, Earle told an interviewer, "None of my salesmen have ever been accused of lying to students." WATCH (at 15:00). For-profit colleges are supposed to be, um, colleges, and they generally refer to the people who speak with and enroll students as "admissions representatives" or "admissions counselors." The whole bad rap on these institutions focuses on how they use deceptive and high-pressure sales tactics to get students to enroll -- that they act like "salesmen" (or "used car salesmen") and refer to students as "starts," "pieces of business," and even "asses in classes," rather than focusing on the students' best interests. For the Career Point CEO to refer to his admissions team as "salesmen" shows what this is really about. But allegations of misconduct at Career Point actually focus more on financial aid practices than on salesmanship. On October 13, the Department of Education wrote to Earle, recounting that Career Point had informed the Department that it illegally held on to $4.6 million that should have been returned to students or to the Department, and informing Earle that the Department was putting the school on "heightened cash monitoring" status and requiring Career Point to post a $10 million letter of credit. 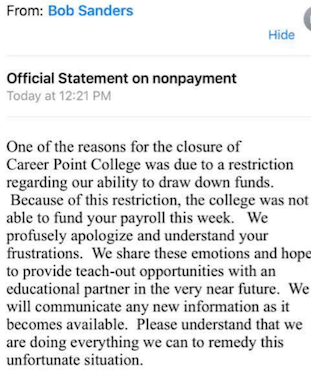 In response, Career Point issued a "Closure press release" announcing that "the College's management has been forced to discontinue operations." The release defends the company's record and blames "this very hostile government climate against for-profit schools." It adds, "the Department of Education chose not to give the College a chance to fix its problems and instead chose to effectively terminate the College.... in light of the actions by the Department of Education, we had no choice." In fact, the Department of Education did not "terminate" Career Point College. In light of the company's admission that it had kept nearly five million dollars that belonged to students and taxpayers, the Department took the prudent and appropriate step of requiring the company to post a letter of credit equal to 25 percent of the school's annual take of federal student aid of $40 million -- so money might be available to pay the school's obligations in the event of further financial mismanagement or abuse. When for-profit giants Corinthian Colleges, in 2015, and ITT Tech, a few weeks ago, each shut down after facing multiple investigations for fraud and after receiving hundreds of millions and even billions in taxpayer dollars each year for decades, each announced it was broke and declared bankruptcy, leaving defrauded students and taxpayers, not to mention employees and other creditors, out of luck. In light of this reality, larger letters of credit are absolutely appropriate where there is evidence of financial mismanagement or fraud. Career Point, in fact, told staffers by email on Friday that it was "unable to fund your payroll this week." Can't make payroll the week of the shutdown? Where did the hundreds of millions of dollars that taxpayers sent to the school over the years end up? In the new lawsuits, attorneys for students allege a range of improper practices by Career Point, including failing to apply federal aid to student accounts, pushing students into expensive private loans, and even charging students for meetings with the school's financial aid office. The suits also allege that Career Point staff have been shredding company documents, and last Thursday a Texas state judge granted a temporary restraining order directing Career Point not to destroy documents linked to the students who sued. In fact, students and former staff have made multiple complaints regarding Career Point to the Texas Workforce Commission and the U.S. Department of Education (and to me) going back several years. In his TV interview, Earle said, "The college, except for a few employees, did nothing wrong."